Nerds and geeks of a certain age fondly remember Macross/Robotech, Star Blazers and other spectacle-filled, emotionally overwrought animated space operas from the 1980s. These Japanese series remain touchstones for a generation and some folks miss them quite a bit. Jake Kazdal is one of those people and the game designer decided to make a game paying homage to those old shows. It's called Galak-Z: The Dimensional. I tried out the game this weekend at PAX Prime and can say it's beautiful. And hard. As you'll see in the interview above with Kazdal, Galak-Z infuses its side-scroller shooter gameplay with modern elements like advanced AI and stealth mechanics. If you're not shooting when flying through the cold void of space, you can sneak up on enemy patrols. And those same attackers will try to flank and surround you in combat, too. 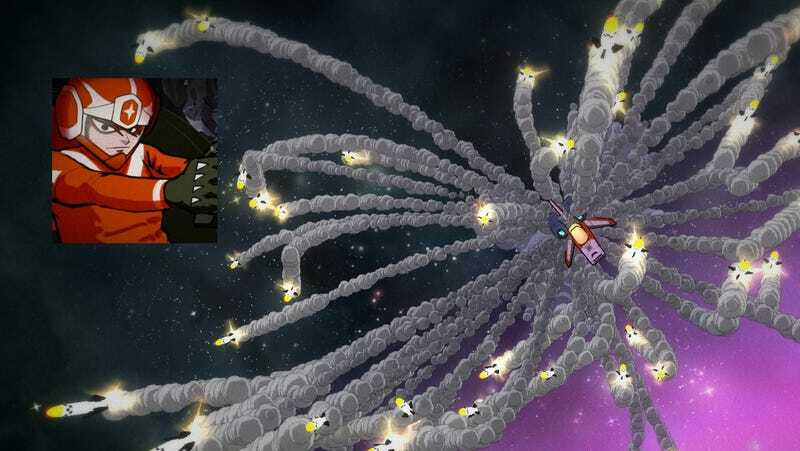 You'll want to play Galak-Z like a typical shoot-em-up: just blasting your way through anything that moves. But it demands quite a bit more strategy than that and that challenge—along with its retrolicious throwback feel—make for a pretty enjoyable experience. Look for it to hit PS4 and other platforms next year.